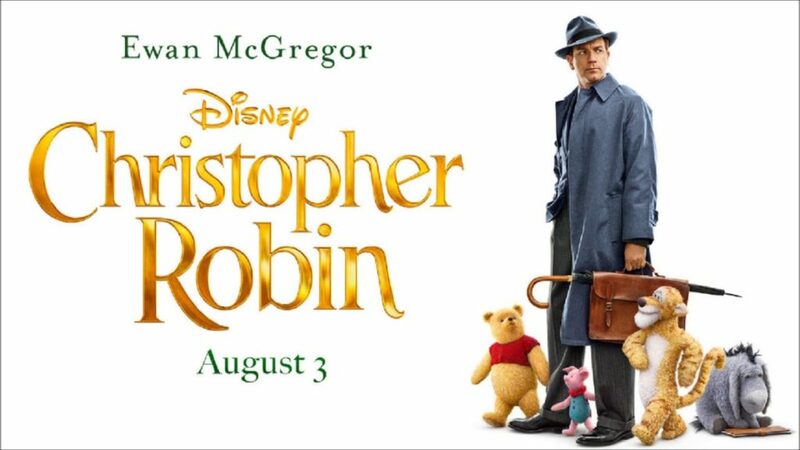 While I only have a few vague memories of reading, watching, or playing with Winnie-The-Pooh and Friends as a kid, I still headed to the theater last week on opening night to see the new Disney film, “Christopher Robin” for one reason and one reason only, to appease the inner child in me. Most of us in this world don’t appease our inner child whatsoever and few do so on a regular basis. Rather, we’re brought up to wear our “big boy” or “big girl” pants and leave that kid in us behind. Sadly, because of that, the things that once brought light and joy to our very souls are left behind as well. This is the very premise of “Christopher Robin”, which stars Ewan McGregor as the titular character in his adult years. While the beginning of the film quickly chronicles how Christopher came to meet Pooh and his friends and shows how he spent much of his early childhood playing with them, it also shows how life circumstances led to him letting them go and ultimately forgetting about them altogether in the process. That is until one day, many years later, Pooh can’t find any of his friends in the Hundred-Acre-Wood where they all live. In his nervous search for them, he comes to the very door at the base of the huge tree where Christopher Robin once came and went, day after day, to spend with him. Suddenly, the door swings open for the first time in a very long time, longer than Pooh can remember, causing him to decide to enter it with one purpose, find Christopher Robin who can hopefully help him find his woodsy companions. When the passage behind the door magically transports him to the very park outside Christopher’s home, it’s inevitable the two are going to meet through happenstance and when they do, it doesn’t take long for Pooh to see that Christopher has lost sight of their special relationship they once shared. Instead, he sees Christopher Robin has become totally consumed with his job, a job that has even caused him to completely neglect his wife and daughter as well, so much so, that they went on their holiday without him. Unfortunately for Christopher Robin, he doesn’t see any of this and instead tries to quickly usher Pooh back into the tree from which he emerged after such a very short visit, hoping to swiftly return to the work he’s become so consumed with. But, when they both realize the door in the tree has vanished, what begins as a quest to return Pooh home, actually turns out to be an adventure of Christopher Robin rediscovering the very kid he left behind so long ago. “Christopher Robin” is such an endearing film. It truly warmed my heart and brought out the kid in me quite a number of times throughout its running time. Thankfully, I learned many years ago how important it is to never lose sight of that part of me, that inner child. Deep down inside each and every one of us is still a little boy or girl who desperately wants to play from time to time and totally forget about the stressors of life. But, far too many of us never do that because we got told at some point to grow up and remain that way. Because of this, life often tends to become miserable and mundane. We go to work to earn a living to pay the bills to support ourselves and our families and somewhere along the way, that little kid in each of us is left in a corner crying, desperate for attention. I have personally made sure though to always do my best to embrace that kid in me nowadays and never let him return to that corner in tears again, which is precisely why I regularly go play miniature golf, or tell silly jokes, or make goofy faces, or eat sundaes with tons of toppings, or watch superhero cartoons, or play Ms. Pac Man and Galaga, or do a number of other things as well. Because I know how important it is to appease that kid in me and how sad my life felt for all the times I did not.